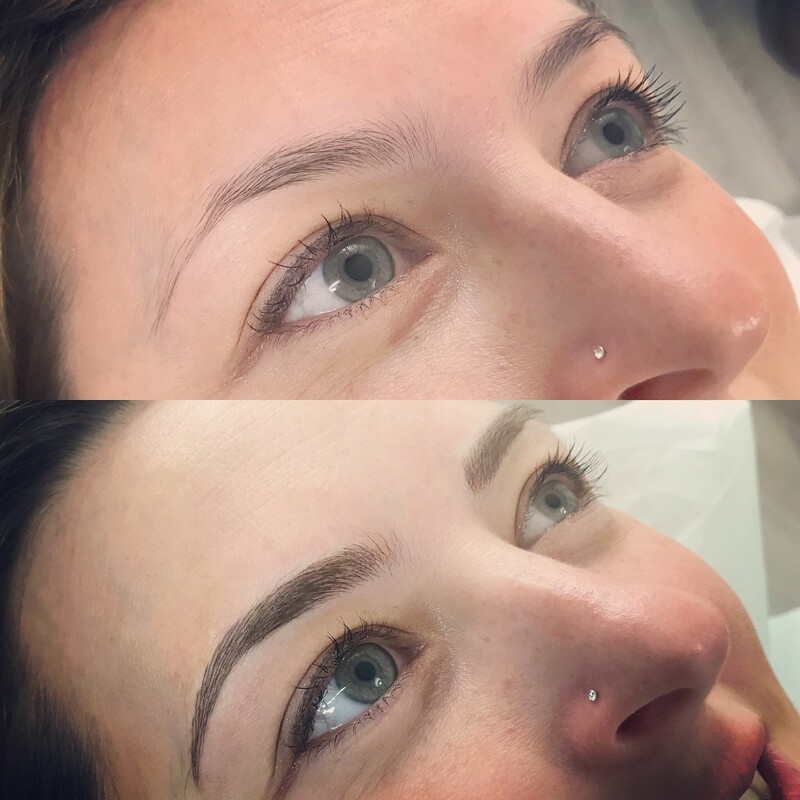 Microblading falls under the semi permanent makeup and cosmetic tattooing spectrum, and is a procedure carried out to enhance or restore a persons eyebrows, mimicking realistic hair strokes for a super natural look. It helps to improve or create eyebrow definition, cover gaps of lost hair, extend the eyebrows, or fully reconstruct the brows where they have little/no hair. Sparse or missing brows can be completely restored. Microblading originated in Asia and uses a manual hand tool, with specially designed sterile microblades, to deposit semi-permanent pigment under the epidermis of the skin. Unlike a machine, using the hand held microblade means the colour is deposited closer to the surface, leaving crisp, thin and realistic hair strokes, creating the most beautiful natural looking brows. Each stroke is applied individually, allowing control of the shape, colour and density of the brows. 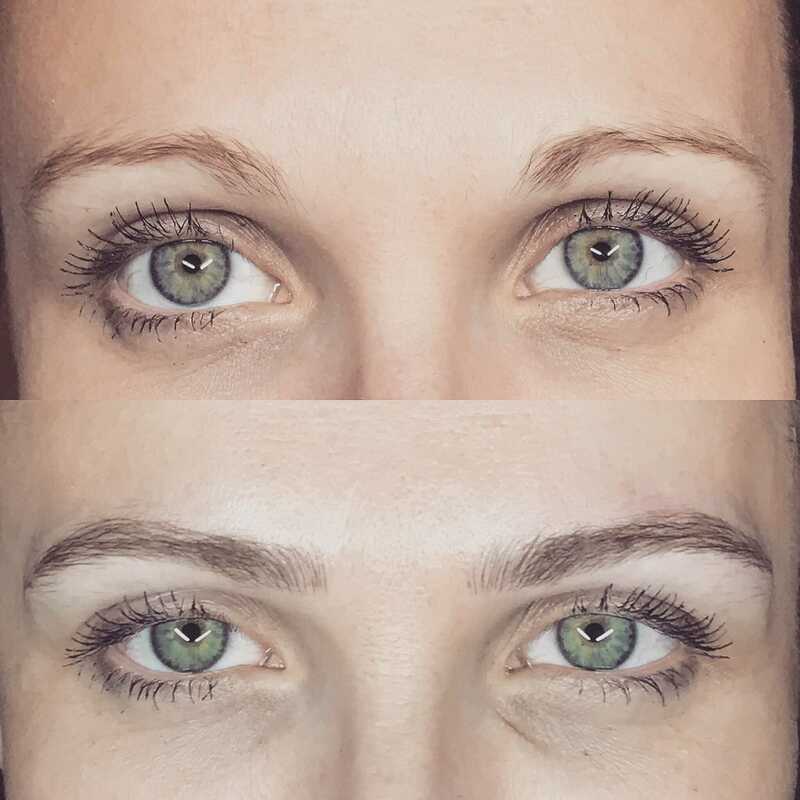 Microblading on average lasts anywhere from 6 months- 1+years. Results vary depending on the persons skin type and biology, including other environmental factors, as such results cannot be guaranteed. Microblading is usually a 2 stage process (see 'top up' info under the price list page). At the 2nd top up/refresh appointment which is carried out approximately 5-6 weeks later, more pigment is implanted into the hairstrokes including any areas which have been lost or lightened during healing. Barely There Brows are also carried out using a digital machine. They offer a super soft pixalated powdery finish which is borderless and translucent. These are perfect for those who are just wanting a slightly shading/colour behind the brow for some definition and to better frame the face, without anything looking too bold or dense. They are the perfect introductory brow for those who are a little hesitant about semi permanent makeup as the density can be increased should they ever wish to go more bold in the future. ‘Barely There Brows’ tend to last around 1+ years however results vary depending on the persons skin type, biology, medical state and environmental factors. ‘Barely There Brows’ are suitable for ALL skin types, and are usually only a one stage process, being complete after the first session. Although suitable for all skin types, Barely There brows are not always suitable for all brows types. Suitability with be discussed with your technician. Airbrush Ombré Brows are carried out using a digital machine and offer a gradual fade in density from a Dense Defined Baseline up to a soft Borderless Pixel Headline. They are perfect for those wanting a little more strength over the super natural Microbladed look. These brows heal with a soft powdery finish which mimics the appearance of makeup, without any harshness or strong upper borderline. Ombré airbrush creates seamless stunning brows which remain soft yet defined and take away the need for the daily application/reapplication of makeup. The density in an ombré brow can be adapted to the client, from a soft and subtle ombré brow, up to a strong and dense ombré brow. Powder Brows are similar but don't graduate up to to a soft fade so the density is similar throughout the majority of the brow. Ombré brows tend to have longer retention over Microblading, usually 1-2 years. Results vary depending on the persons skin type and biology, including other environmental factors. Ombré brows are suitable for ALL skin types unlike Microblading, and are usually a 2 stage process. At the 2nd refresh appointment which is carried out approximately 6 weeks later, more pigment is implanted to any areas requiring more density, or any areas which have been lost or lightened during healing. Free consultations are provided at Ibrowink Boutique and the most suitable brow type will be discussed- Each set of brows designed are totally bespoke to you using pigment made with the very best ingredients. Techniques are used to improve or create eyebrow definition, to cover gaps of lost hair, to extend the eyebrows or to fully reconstruct the brows where they have little/no hair. Sparse or missing brows can be completely restored. Please advise your technician if you have previously had Microblading or any cosmetic tattooing of the brows. For those lacking brow definition or for those wishing to change their brow shape. To thicken or add density to thin or sparse brows, especially those caused by years of over plucking / tweezing. To replace individual hairs which may have been lost through Alopecia, Chemotherapy, Trichotillomania or any other medical condition, via natural looking microbladed hair strokes. To replicate makeup and prevent the need for the daily application of this. To cover scarring or gaps within the brows. To lengthen the tails of existing eyebrows. To correct asymmetry of the brows. To add colour / intensity to the brows. For those with active lifestyles whereby wearing make up or reapplying makeup throughout the day isn't suitable. For those who have trouble applying conventional makeup or do not wish to wear makeup. Reduces the amount of time it takes to get ready in the morning - no more waking up with a need to 'put on your face'. Smudge and smear proof. Clients can enjoy an active lifestyle without the worry of the brows getting ruined. Reapplying your eyebrow makeup can be a thing of the past. Gym and swimming sessions just got a whole lot easier. Brows always look fresh and tidy, unlike eyebrow powders and pencils which can look messy and faded throughout the day. To restore brows with crisp and natural looking hair strokes or a shading effect to replicate makeup and prevent the need for application of this. To give those with skin diseases like alopecia or hair loss- secondary to chemotherapy, a natural looking brow. The natural and crisp looking characteristics of microblading make it very difficult to tell you have even had the procedure done, which is often the desired outcome for those who have lost eyebrow hair due to medical reasons. On average, it is only a 2-3 hour procedure with results lasting between 1-3 years. Results are influenced by individual and environmental factors such as sun exposure, lifestyle and personal skin types. Imagine years of worry free brows and the time saved each day. Minimal healing time and simple aftercare for a long lasting result. As this is a 'semi' permanent procedure, it allows you to change the shape of the brow with new trends, should you so desire this. It is very safe. Microblading and Cosmetic Tattooing are safe in the hands of a trained and qualified Technician. It is minimally invasive and all measures are taken to ensure the procedure as comfortable as possible. A medical history form will be completed at the initial consultation to determine your suitability for Microblading or Semi Permanent makeup. Some of the above listed reasons do not automatically mean you are unable to have these procedures. Some medical conditions may simply require a note from your GP giving clearance and consent to the procedure taking place. Other conditions which pose risk, may require the client to sign a disclaimer should they still wish to undergo the procedure. Please do not hesitate to message me should you wish to discuss anything. Please note these procedure cannot be performed on those under the age of 18 even with a consent form. Due to a lack of medical and scientific research on Microblading and semi permanent cosmetic tattooing during pregnancy (and whilst breast feeding), Ibrowink Boutique are unable to perform these procedures on any person who is pregnant or breast feeding. For any person currently receiving Chemotherapy, comsetic tattooing is not recommended due to the higher risk of infection and an uncertainty on the way pigment may be affected. These procedures are however possible before Chemotherapy treatment commences and following treatment. Aftercare instructions will be discussed with you at your appointment as this will be specific to you and your skin. It is important that the advice is followed correctly to ensure the brows heal as best as possible. Initially, following the procedure, your brows will appear darker than what is expected of the final result. Approximately 25% - 50% of the colour can fade during the initial 10-20 days. This is very normal and is an expected result of the application and healing process. Although the area will appear to be healed it will not be fully healed for approximately 5/6 weeks. Continue to follow aftercare instructions as recommended within your appointment. To avoid fading or loss of pigment, avoid steam and heat treatments for at least 14 days- Ideally and wherever possible, these are to be avoided until the eyebrows have fully healed. Do not pick, peel or scratch the protective scab that forms on the area. This contains pigment and it is important not to remove the pigment from the skin prematurely. Do not touch the area after the procedure. Try to allow the brows to heal naturally. During healing, do not perform activities where the scab can be irritated. Do not perform activities where excessive sweat is caused as this could cause the scab to peel causing potential scarring. Do not swim or go in a sauna /steam room / hot tub for at least 14 days- Ideally and wherever possible, these are to be avoided until the eyebrows have fully healed. Try to avoid hot steamy showers where possible. If the tattooed / pigmented area becomes wet, lightly pat dry. Avoid Sunlight and Sun beds for at least 14 days- Ideally and wherever possible, these are to be avoided until the eyebrows have fully healed. Use a complete sun block on the treated areas after the 14 days wherever necessary. Do not apply make-up to the eyebrow area for at least 14 days wherever possible. Avoid eyebrow tinting for at least 14 days following the procedure. Ideally and wherever possible, these are to be avoided until the eyebrows have fully healed. Keep your eyebrow area free of any products or lotion for at least 14 days. This especially includes any anti ageing products, retin A, retinols, moisturises, glycolic acids and exfoliants. These can cause pigments to fade and lighten prematurely. Ideally and wherever possible, these are to be avoided until the eyebrows have fully healed. If you are planning a chemical peel or aesthetic treatment, please inform your therapist of the procedure you have had. Such procedures should be avoided until the healing process is complete. Botox should be avoided for 2 weeks following the procedure. Do not drink alcohol after the procedure for at least 24 hours. After a microblading or semi permanent cosmetic procedure, you may feel a tight or heavy feeling around the eyebrow area or have a slight headache although rare. There may be slight swelling or redness. To reduce any possible swelling you can apply a cold compress to the area that has been treated. Although rare, excessive swelling or an allergic reaction may occur. If you do suffer an allergic reaction you should consult your GP immediately. If an allergic reaction causes difficulty in breathing or swallowing, call 999 or go to the hospital immediately. Following the initial procedure, you will require a top up treatment at around the 6 week mark. This is necessary to perfect and refine the brows as everyone heals differently and as pigment will fade. If you fail to attend your top up appointment within 6 weeks or the timeframe provided by your technician your results will fade and you will be charged at the full rate on your next appointment. A colour boost is strongly recommended to keep your brows looking fresh and optimal. This is because the pigment will gradually soften and fade overtime. Colour boosts are important to maintain the brows and to achieve the best possible ongoing results. Colour boost prices are available at www.ibrowinkboutique.co.uk. Annual colour boost prices are honoured if booked within a maximum of 14 months following the initial microblading procedure (18 months for digital brows). After these time frames, you will be charged at the standard rate for a new set of brows. Remember, results cannot be guaranteed and some peoples brows will retain longer than others. Results tend to last anywhere from 6 months to 2+ years depending on the brow type chosen, but there are no certainties. Colour boosts timeframes are therefore individual to the persons and must be judged on their own retention (see price list). The advice is to return for your colour boost before the strokes/pigment is too faded out- it is very important they are still visible for your Technician to see. If pigment is too faded this can affect the results and you risk needing two appointments again which will be charged at the rate of a new set of brows. A colourboost should only need to be one appointment.